For the past three years, we have witnessed a carousel of Brexit-related ups and downs. Endless trips to Brussels and votes in Parliament have exhausted not only politicians but also the British people and business people who need to keep on working on shaky territory. In the latest episode of FinancialFox, James Bevan, asset manager and Chief Investment Officer at CCLA shared his insights about Britain’s divorce from the EU, and the post-scenario for the UK and business. 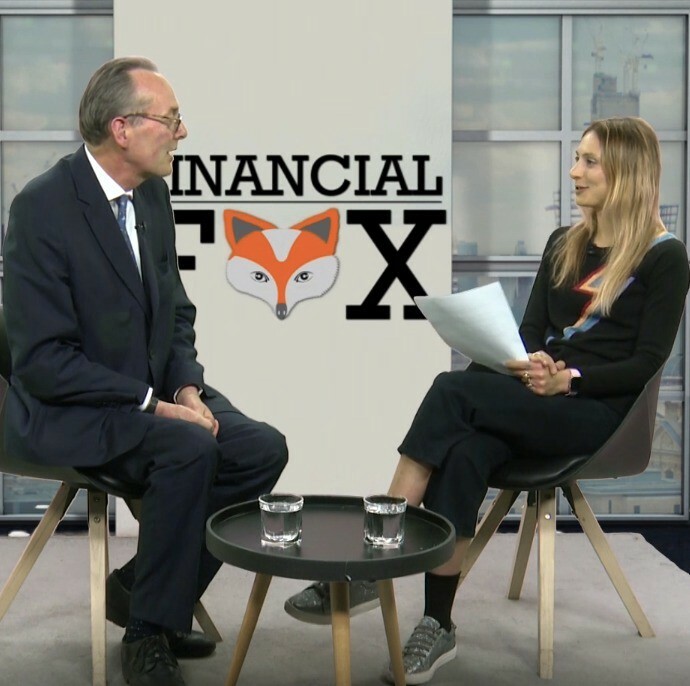 James Bevan talks to PR Guru Stefania Barbaglio in the latest episode of FinancialFox. Nevertheless, there are many challenges which could hinder such growth. James points out that the UK economy is largely reliant on the services sector, and if Britain wants to keep its competitive edge on the global stage, it has to increase internal productivity and entrepreneurship. In practical terms, the uncertainty around how post-Brexit Britain would look is the same now as it was three years ago. Much has been said about the slowing of the economy as an immediate result of Brexit. Analysts do 2019 to be slow in terms of activity; growth should pick up again next year. 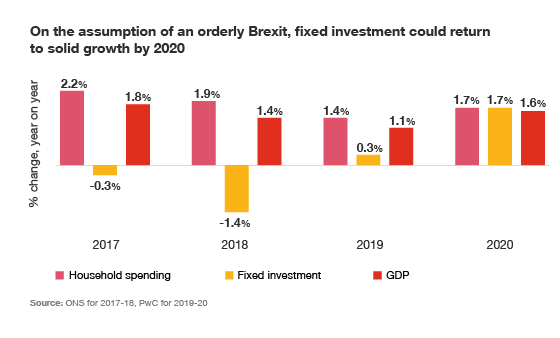 According to PwC’s UK Economic Outlook report released in March, UK growth is to dip to 1.1% in 2019 and to strengthen only moderately, to 1.6% in 2020. While no decisions are made in Westminster and political battles make for a gloomy outlook, in the City of London ̶ and more specifically in Shoreditch’s Tech City ̶ businesses continue to flourish. Fintech is indeed one of the gems of the British finance sector, and rightly so: in the first six months of 2018 alone, the UK attracted a record high £12bn of investment in Fintech. London is quickly catching up with San Francisco, the global capital of fintech. City AM reported that, among the 29 fintech unicorns ̶ companies with a valuation of more than $1bn ̶ nine are in San Francisco, while seven are based in the UK capital. Last year, London received more than a third of the European fintech venture capital funding. Will this trend continue to point upwards after Brexit? 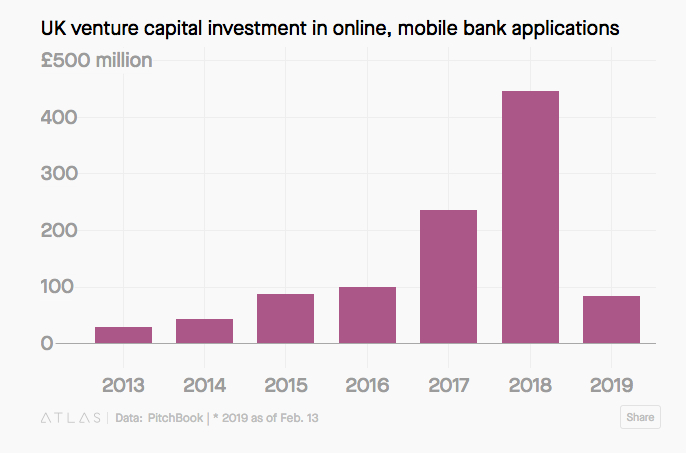 Some experts think so, as investments in digital banking projects continue to pour in in 2019. According to QZ, the chief executives of the payment app and fintech unicorn Revolut, and Clausematch, a compliance company, get five to six calls from investors each week. Revolut CEO Nikolay Storonsky claimed that Revolut may look to raise $500 million or even more in 2019 as the company’s valuation increases. Anne Boden, CEO of digital banking platform Starling Bank, says the positive outlook on UK’s fintech can be attributed to the uniqueness of the companies, and that not many new projects are being licenced. One of the main arguments of Brexiteers is that, once outside the EU, the UK would have more autonomy over its trade agreements and commerce partners. In the technology sector, we see that the UK has proactively looked for partners outside the European bloc. Closer relationships with emerging markets are particularly positive in this scenario, given the rapid growth of their digital economies and the market opportunities posed for fintech companies based in Britain. International partnerships are crucial, given that most the UK’s trade agreements nowadays happen within the EU, rather than outside. In a quest to widen its outreach, British officials have started talks with other countries. In March, leading members of the Thailand and Vietnam Fintech communities were in London to visit world-leading Fintech businesses. “As we leave the EU, the UK is working harder than ever to build Fintech partnerships with others. We have put Fintech at the heart of the UK’s ASEAN Economic Reform Programme, which will focus on Southeast Asia and which aims to promote inclusive economic growth. This three-year programme will provide technical assistance and the opportunity to share experiences in support of the continuing development of Fintech regulation in Thailand, Vietnam and some other ASEAN countries,” said MP Mark Field about the deepening relationship with nations in Southeast Asia.